In this article Mike Ladle describes some fascinating experiments undertaken to see what senses fish use to locate and identify prey and explains how anglers can use this information to improve their success rates. While much of the information relates to UK fish species the general principles will probably also hold true for many NZ species. Some of the information in this article may seem a bit technical but it is absolutely vital to understanding well known angling principles such as – ‘are big baits best for big fish?’ – ‘should you keep the bait on the move?’ – ‘does colour or pattern matter?’ and – ‘do smelly baits attract fish?’. Now we come to the tricky business of understanding the senses that fishes use to locate and identify their prey. The sense organs and degrees of awareness of fish have been described at length in many angling books but little attention has been paid to the much more relevant subject of fish feeding-behaviour. Experiments on the behaviour of fish, or of any other group of animals, have to be carried out with exceptional care because it is only too easy to disturb the creatures being studied. It is also possible, inadvertently, to teach or condition the fish to behave in an abnormal way. 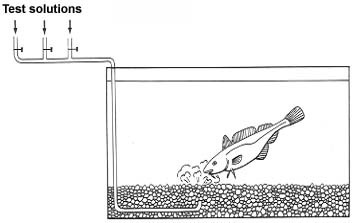 A good example of experiments on fish feeding-behaviour was carried out with the marine, fifteen-spined stickleback (Itself a food of bass). Although this is not an angler’s fish in any sense, this study illustrated the importance of form and presentation of bait to any species. In this work the sticklebacks were given food in the form of mysids (opossum-shrimps), shrimp-like creatures of less than an inch in length with large prominent eyes and thin stick-like bodies. Each shrimp was fastened into a special tiny harness made from a slim glass tube, through which was threaded a loop of fine nylon line. The shrimps were then suspended on thin rods into a fish tank containing the sticklebacks. To avoid disturbance, the sticklebacks were observed through a narrow slit in a screen or by means of carefully arranged mirrors. Before each experiment each fish was starved for twenty-four hours and then released into the tank by the raising of a small trap door. 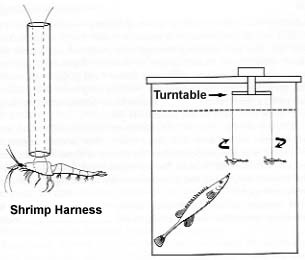 Comparisons between still and moving prey were made by rotating the rods from which the shrimps were suspended by means of a little turntable operated by a variable speed motor. 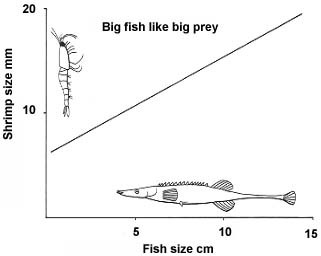 The results of many experiments have been summarised in Table l.
It was shown that the most important factor in prey selection was movement; a moving shrimp was almost always picked out in preference to a stationary one. Next in importance was size, the fish selecting shrimps of a preferred size rather than those that were either larger or smaller. Dark-coloured prey items were preferred to paler specimens. Lastly, the head ends of the prey induced much stronger feeding responses than did the tail ends, a preference which has also been demonstrated in larger predatory fish, such as the freshwater pike. Clearly, in the case of the fifteen-spined stickleback at least, movement, size, colour and shape of the `bait’ are all-important. There was also evidence that the effects of these features could be additive. In other words, the most attractive food would be of the correct size, shape and colour, moving in the right way at the preferred speed. In another set of experiments it was shown that hungry fish were less fussy than well-fed fish, and that the `handling time’ of prey was less in a hungry fish. This is just the sort of detail that could explain differences in the frequency and character of bites at different times. A nocturnal feeder such as a conger or a pouting might thus be expected to give better bites in the evening at the start of the feeding period and vice versa. When the fish were presented with a choice of prey size, it was clearly demonstrated, by examining the stomach contents, that large fish preferred large prey. Similar big bait/big fish observations have been made on a number of other fishes, and no doubt, in view of the experiences of many anglers, are widely applicable. This is not to say big fish will never take small baits but that the more numerous small fish are liable to take the small baits first. Another species, which has been the subject of investigation, is the cod. Studies on the reactions of cod to objects and tastes (scents in water) have been made. A series of tanks were used into which different particles or juices could be introduced to cod of between two inches and three foot in length. Cod were shown to detect food in mid-water by sight and rarely missed any moving food. Even large cod could see tiny particles of food as small as one millimetre in diameter, but four millimetres was about the smallest size to be taken consistently (nine times out of ten). Large pieces of food, laying on the stones on the bottom of the tank, were also detected by sight but small pieces were found by `taste’. The cod swam along near the bottom of the tank with its barbel and the tips of the long, thin pelvic fins brushing the seabed. When any of these three antennae, all of which are well armed with taste buds, touched a piece of food, the cod backed up and swallowed it. The taste of many different seaweeds, invertebrates and fish could be detected. Food hidden beneath stones or gravel was also found by smell/taste and was uncovered by digging, which involved the fish lifting away stones in its mouth or rolling them away. A group of fish would cooperate in digging to uncover food, though food buried under sand was not detected. The feeding behaviour of one fish attracted others to the area. This is a good indication that, as in the case of flounders, attractor spoons and flashers really are worthwhile in cod fishing. It is of some interest that in very cold water of less than 2°C cod are not able to open their mouths widely and this limits the size of food taken. Several members of the cod family have a triangle of sensory antennae like those of the cod itself. No doubt haddock, pouting and poor cod use their barbels and pelvic fins in a similar way to that described above. Workers at the Fisheries Laboratory at Lowestoft examined the responses of cod to chemical attractants in water. They used a circular tank in which a current could be produced in either direction. An extract of squid in sea water was used as an attractant and the events recorded via a mirror through to a cine-camera. In the absence of food or introduced squid extract the fish swam steadily downstream. The cod would pick up a piece of squid placed on the bottom of the tank but ignored the little pipe through which squid extract was to be introduced. Squid extract was trickled in upstream of and behind a fish, which had just swum past the pipe. On its next circuit the fish sensed the extract, turned upstream and swam towards the pipe, searching from side to side and occasionally darting forwards. If it passed the pipe the fish turned and swam or drifted downstream until it again detected the scent. The mouth of the pipe was usually located in less than forty seconds. 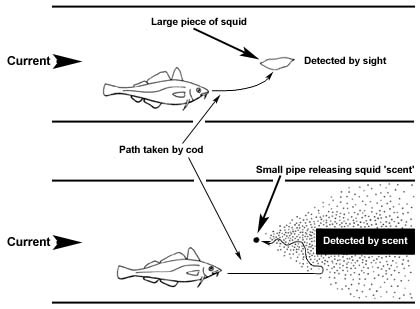 There is some evidence that other members of the cod family use a similar searching pattern in the sea, drifting with the tidal currents until the scent of food is detected and then turning upstream and following a scent trail. This method of search would be particularly important at night and in deep or dirty water. The cod was also the subject of experiments in which the degree of attraction of different dissolved odours were compared. To the angler the results are astonishing. The most attractive odours were those of conger eel skin, the Nerine worm (a burrowing greenish worm with two long tentacles) and, thirdly, water used to rinse human hands. Extracts of spider crab and butterfish were the most strongly repulsive to the fish. Perhaps at this stage examples of the food, which has been found in both small and large cod, should be presented. In general there is a change from foods such as shrimps, swimming crabs, porcelain crabs and butterfish (despite the fact that the scent of these fish were repulsive to the cod used in the experiments) in the small fish, to Norway lobsters, sea mice and whiting in larger fish. All in all the cod is not a conservative feeder and clearly its feeding methods present considerable opportunities for experiment with both visual and scent/taste attractants. The different members of the cod family take different foods. Fishes like haddock feed largely on brittle stars and hoppers, poor cod and pouting feed almost exclusively on crustaceans, and whiting and hake eat other fishes. This family is also notable for the fact that some species communicate vocally by means of grunts. Species that are not known to make sounds are whiting, coalfish, poor cod and three- and five-bearded rocklings. Vocal species include, apart from the cod itself, haddock, pollack and tadpole fish. The sounds are of low frequency and the rates of the sound pulses and their grouping differ from species to species. It would seem possible to devise audible means of attracting fish to the fishing area but the complexity of the subject suggests that it is probably not worthwhile”. Fisheries research like this is critically important. If we do not understand life cycles, habitat and the interaction between species then it is impossible to effectively manage the resource. Previous Previous post: FLY FISHING’S DIRTY SECRET?